Hydrocephalus is a buildup of fluid inside the skull that leads to swelling of the brains. The word hydrocephalus is derived from the Greek words hydro (water) and kephale (head). About hydrocephalus, most people have a picture in mind of a baby with a very large head. Something that is much less well known, is that hydrocephalus can occur at any age. Hydrocephalus can cause brain damage, as a complication of bleeding, injury, inflammation or tumor. It can lead to neurological (physical), emotional, behavioral and or learning disabilities. See our page on consequences. A blockage of the drainage within the head which causes the brains to swell. This is also called brain edema. Brain fluid is also known by the names (brain-) spinal fluid or Cerebrospinal fluid (CSF). It is the liquid that is located in and around the brains and spinal cord. The main function of cerebrospinal fluid is shock absorption. Hydrocephalus usually arises as a result of a brain haemorrhage in the first days of life of premature newborn. However, there are also other causes. Hydrocephalus comes forward as a result of a collection of diseases. For each patient, the cause different and the consequences are different. When there is a tumor in the production organ of the cerebral flued (this tumor is called a plexuspappilloma), too much cerebrospinal fluid is being created. Furthermore, hydrocephalus can be caused by a disturbance in the drainage of cerebrospinal fluid. This may be caused by meningitis or by bleeding in the ventricles, or bleeding between the meninges; subarachnoid hemorrhage or, in short, SAH. However, it may also be congenital. The congenital variant of hydrocephalus affects one in every 500 babies. The cause of congenital hydrocephalus that occurs most is a narrowing of the connection between the third and fourth brain chamber (aqueduct Sylvii). Such a narrowing is called "aqueduct Stenosis". In the picture below this is referred to as Cerebral Aqueduct. Hydrocephalus can also develop in combination with other birth defects, such as Arnold-Chiari syndrome and Dandy-Walker syndrome. In the case of the Dandy-Walker Syndrome there is a disturbance in the development of the fourth brain chamber. The symptoms vary by age, but also depend on how much brain tissue is damaged and what is the cause of the increased amount of brain fluid. In the picture below, you see a CT recording with hydrocephalus. 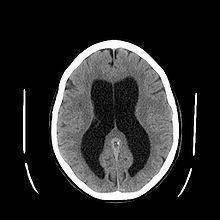 The ventricles are the black spots in the middle. They are enlarged by an excess of cerebrospinal fluid. If a person with hydrocephalus does not get a treatment, the chance that this person will die is very large (60%). The goal of treatment is to reduce or prevent brain damage by improving the flow of cerebrospinal fluid. If there are signs of an infection antibiotics will be prescribed. In case hydrocephalus is caused by a brain tumor an attempt will be made to remove this brain tumor. If the cause is a narrowing of the passageway between the third and fourth brain room (aqueduct stenosis) doctors will try to widen the corridor by an operation. If these treatments have little or no result, often treatment with a drain (tube) is chosen. This drain leads excess fluid into the heart or into the abdominal cavity, In this case we speak of an internal drain. An external drain carries the liquid away to a reservoir outside of the body. A special form of hydrocephalus is the Normal Pressure Hydrocephalus (NPH).